It’s not uncommon to find individuals with brand loyalty. In the automotive realm, these people stick to purchasing vehicles from a single automaker. Then there’s the folks that love a car so much, it becomes the only car they choose to drive. 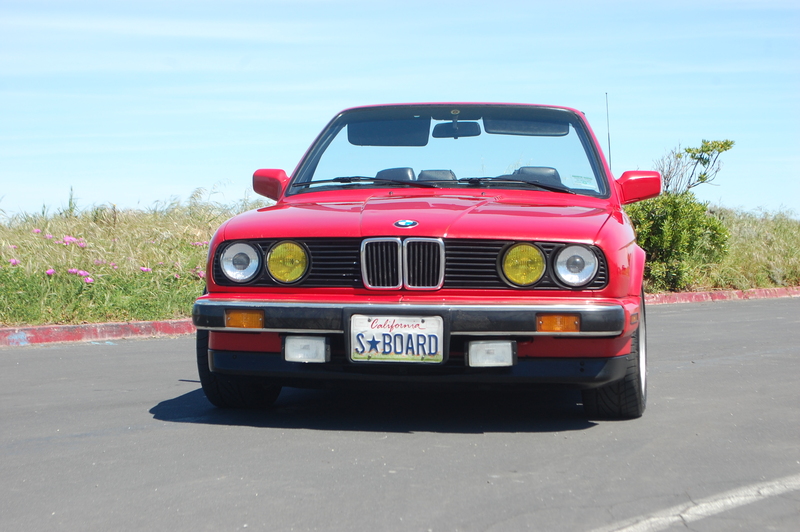 For Marsha Atkinson, the BMW e30 is the car she calls her own. …there was always the desire to get something sportier. What better way than to ditch the roof and enjoy top down cruising? 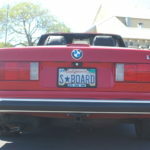 If one thing has always been consistent in the twenty years I’ve known Marsha, it’s that she’s always owned an e30 BMW. 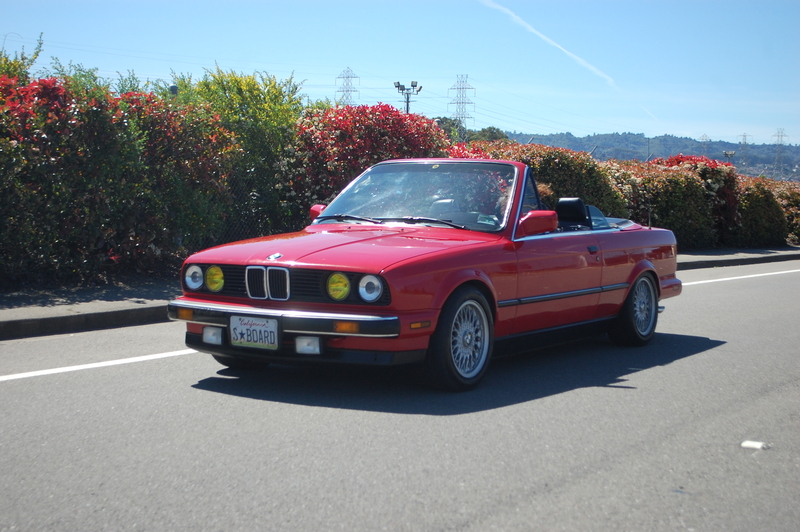 After sitting down and counting, Marsha has owned a total of seven e30s since the mid 1990s. 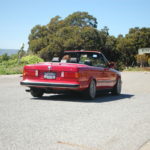 Three of the cars were 4-door sedans, but the remaining four have been convertibles. 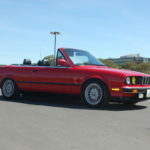 The latest e30 on her roster is a 1989 325i convertible named Red Margo, and it’s the car she drives each and every day. Warm weather means fun in the sun. 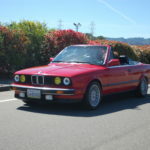 A lowered ride height gives the red convertible a sportier appearance. 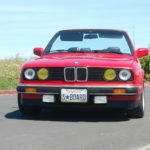 The yellow tinted high beams are an ode to the French market cars. The rowers will understand the plate. 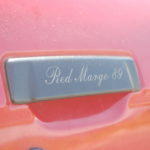 Before purchasing Red Margo back in 2009, Marsha had been daily driving a Bronzit-Beige 325i 4-door. 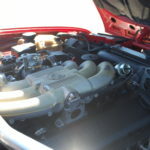 While the sedan worked great for running errands and other day-to-day activities, there was always the desire to get back into something sportier. What better way than to ditch the roof and enjoy top down cruising? So the sedan was sold and the convertible was christened the new chariot of choice. 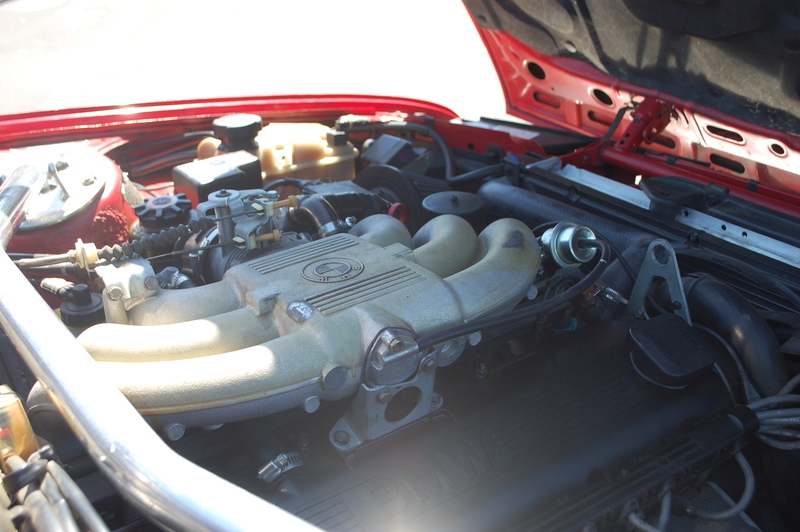 During the first few years, Marsha drove the car as is, performing routine maintenance as needed. 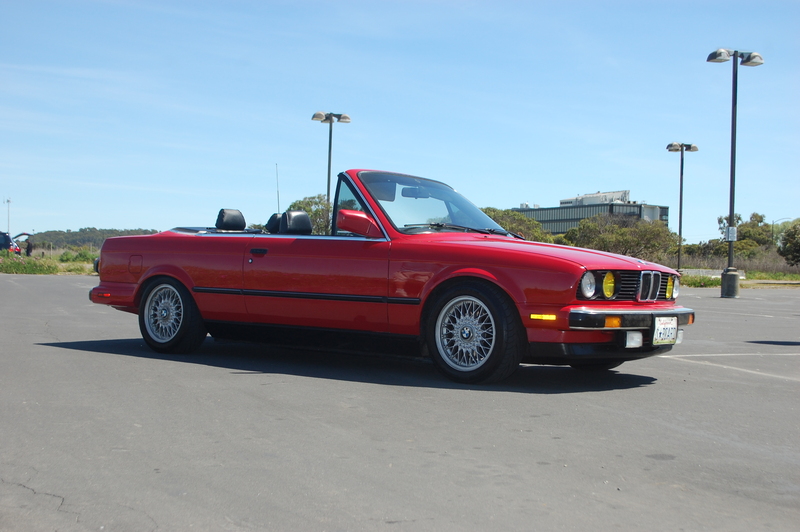 As any e30 owner knows, it’s tough to leave these cars alone. In an effort to give the ‘vert better command of the corners, the suspension was upgraded to Bilstein Sport shocks. A set of H&R Sport springs were added as well, lowering the car 1.5 inches from stock. Due to the lack of a roof, the convertible chassis is known for being a bit loosey-goosey. To help remedy this situation, an Eibach strut tower brace was fitted so the convertible is just as quick to react during spirited driving. 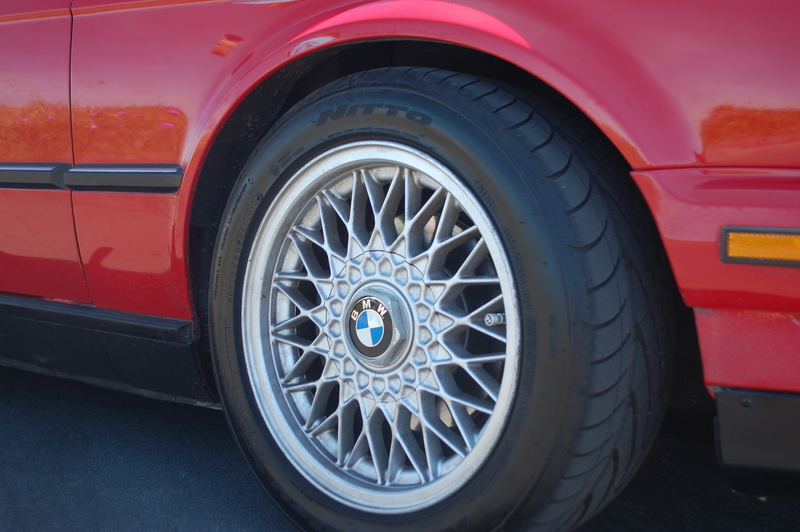 Once the suspension was revamped on the Zinnoberot cabriolet, the stock 14 inch wheels were looking a little dainty. Just like “shoes make the man”, a car’s rolling stock will make or break the scene. To ensure that her car always looks on point, a set of 15×7” BBS Euroweaves were sourced, giving the car a tasteful OEM upgrade. 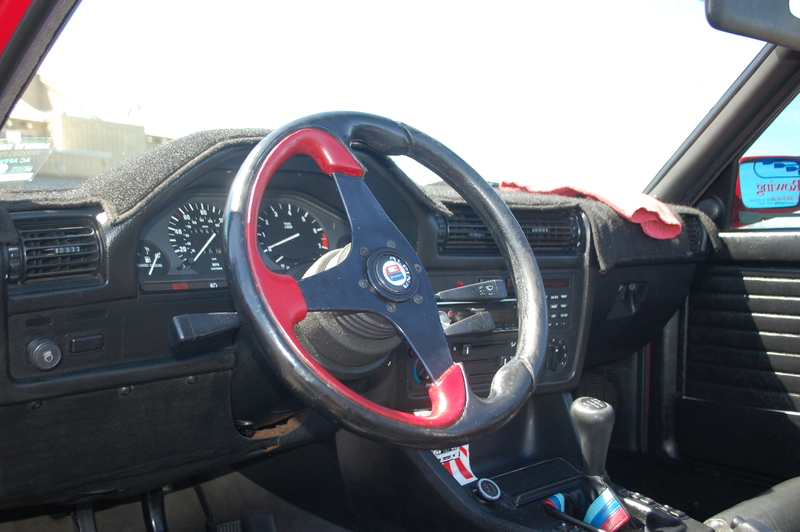 Nardi steering wheel and other custom touches set it apart from your run of the mill black sport interior. 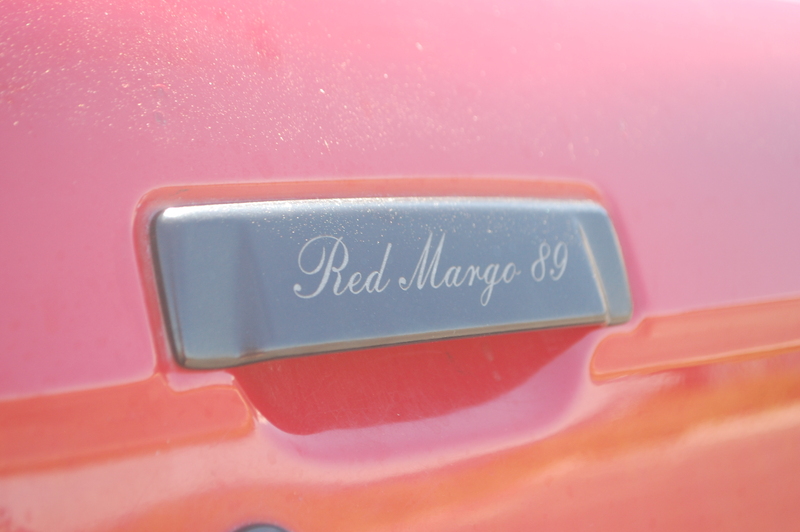 Red Margo, wearing her name proudly on the laser etched door handles. The 2.5 m20 looks very tidy, even with over 200k on the clock. 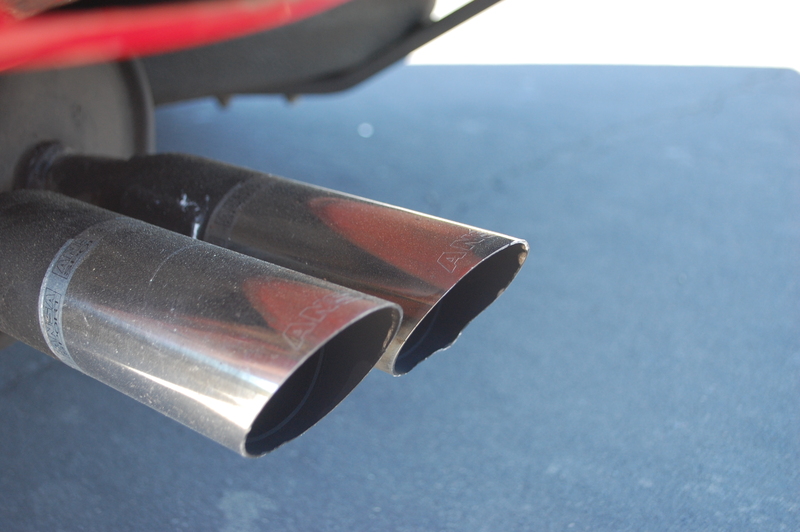 An Ansa muffler gives the cabby a distinct tone throughout the rev range. 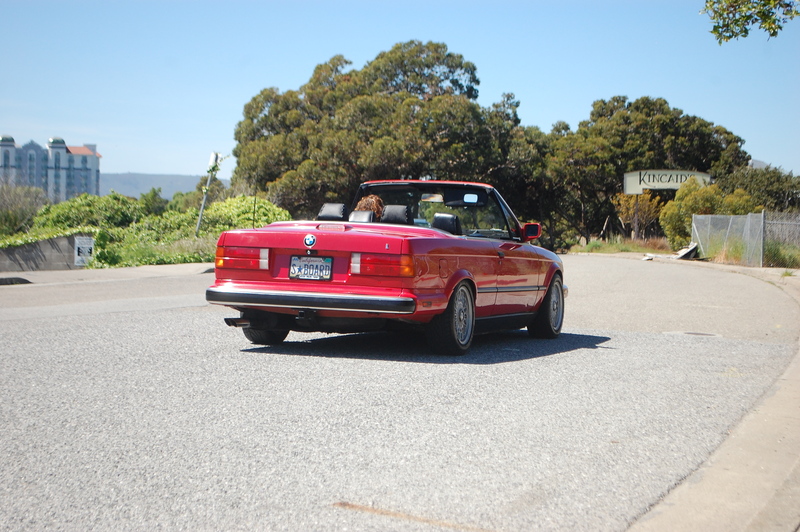 Most e30 convertible owners would have probably stopped at the suspension and called it a day. Not Marsha though. 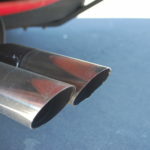 The venerable 2.5 liter m20 has been outfitted with a ram air intake and an Ansa Sport muffler, producing an exhaust note that would make any e30 enthusiast proud. 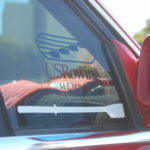 However, it wouldn’t be a Bavarian straight six symphony if the driver couldn’t keep up the tempo. 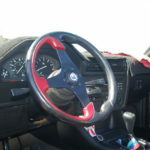 A z3 short shifter makes gear changes slick so the rev happy engine is always in the heart of the power band. 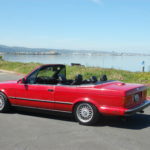 Within the e30 community, leather and sport seats are seen as must-have items, yet only select models came factory equipped with those options. 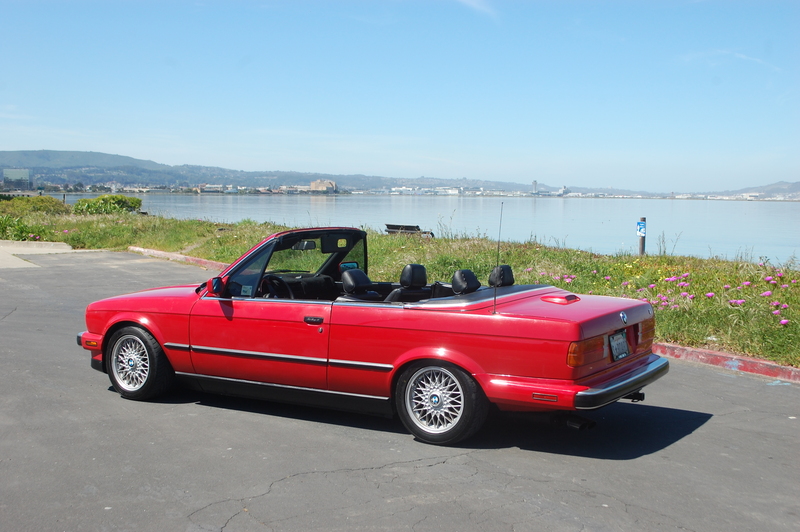 Fortunately for all US bound 325i convertibles, buyers received both as standard. When Marsha first purchased Margo, the black sport seats were looking a bit worse for wear. Patiently watching the local classifieds led her to score a set of replacements in excellent condition. And should extra passengers want to go for a drive, they’ll be able to sit just as comfortably in back thanks to the OEM rear headrest retrofit. An indicator of Marsha’s other pastime. 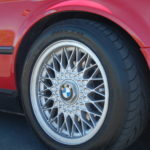 BBS 15×7 “Euroweaves” are the go-to OEM wheel upgrade for any 4-lug e30. 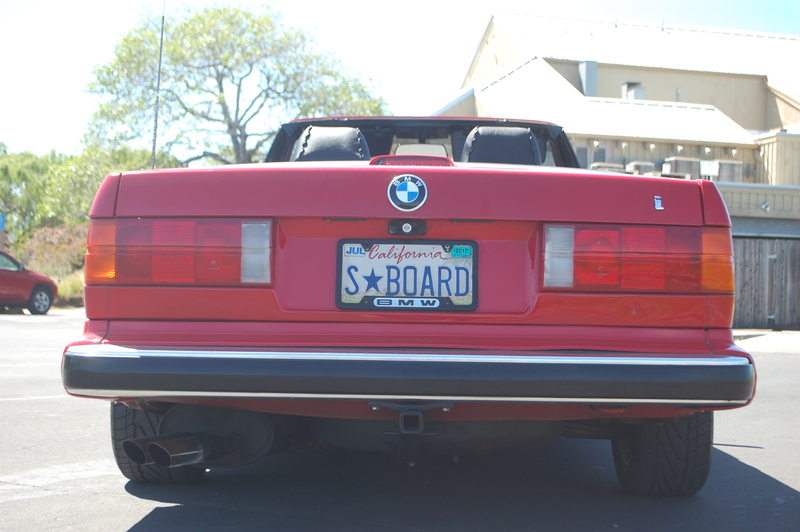 By now you’re probably wondering about the significance of the convertible’s vanity plate. 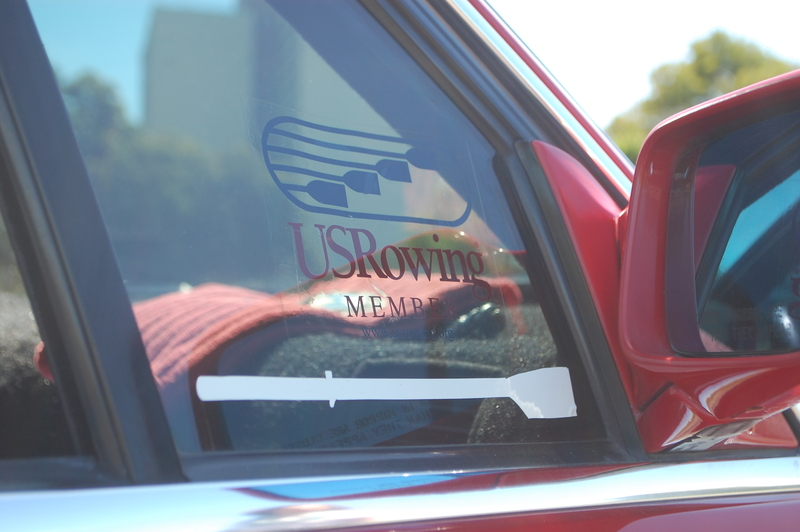 If you guessed boats, then you’re on the right track: Marsha is an avid rower and part of a club team, so her position in the boat is on the starboard side. 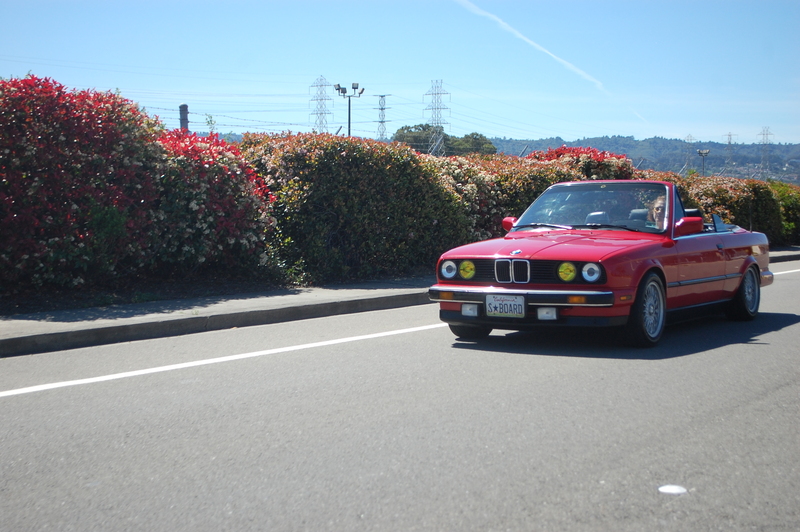 That being said, the little red e30 is the car that brings her to races held all over California. Whether it’s Sacramento, San Francisco, Los Angeles, or San Diego, Marsha and her car are usually on the move. With such a busy lifestyle, it can also be very easy to get caught up going from one place to the next. However, at the end of the day, all it takes is the sight of a familiar red friend parked out front as a reminder that getting there is half the fun…maybe more.